Chris Schlueter, founder of William August Jewelry, comes from a 70 year old family tradition of quality craftsmanship. From childhood, he was mentored by his grandfather Chris G. Schlueter, a respected Chicago jeweler for over 50 years. In the creation of William August Jewelry, Chris has combined this knowledge and tradition with his own technical expertise and a fresh design perspective from over 25 years In the trade to bring you jewelry both unique and with timeless design. Traveling the world, Chris personally handpicks each stone to ensure the finest color and cut. The designs are based on the integrity of the gems, and many pieces are handmade. 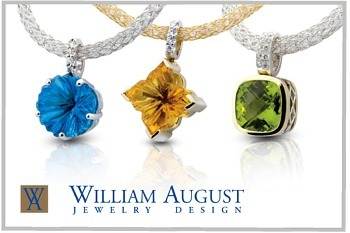 William August Jewelry, the best in distinctive design and the finest craftsmanship.